I believe one of the greatest talents a mom can posses (among the many thousands), is to make leftovers into a magical, glorious new meal. No one secretly digs eating the same thing two nights in the same week, so I'm always on the look out on how to take the same ingredients and make them into something that passes as "new and exciting" for the small fry to try. So what did I do when I had a bit of left over Sloppy Joe meat when there just wasn't enough for a full meal with buns the 2nd time around? I remember one time years back I rolled them in crescent dough for what we called a "Classy Joe", and was declared a local hero by some, but sadly the only carb I happened to have lying about this time around was flour tortillas. Then, the light bulb went off. Angels sang, and the taste buds rejoiced. 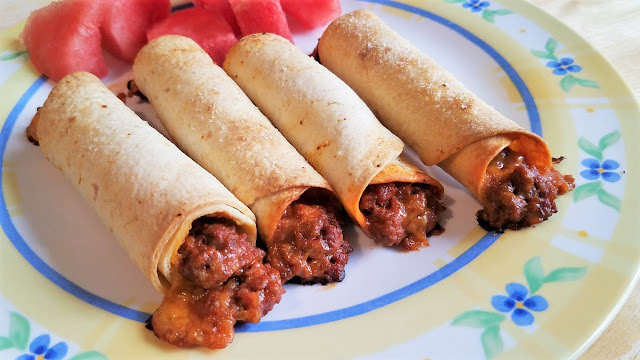 Introducing Sloppy Joe Taquitos!! 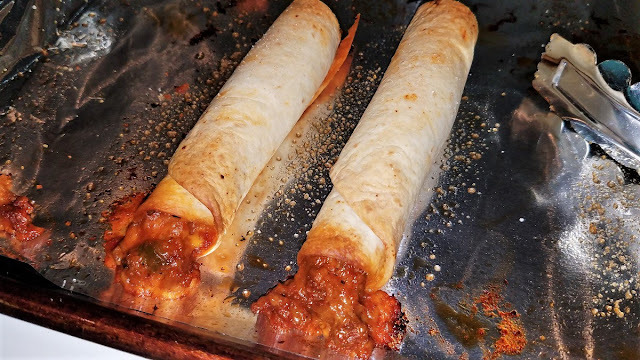 Sloppy Joe Taquitos - They DO say necessity is the mother of invention! 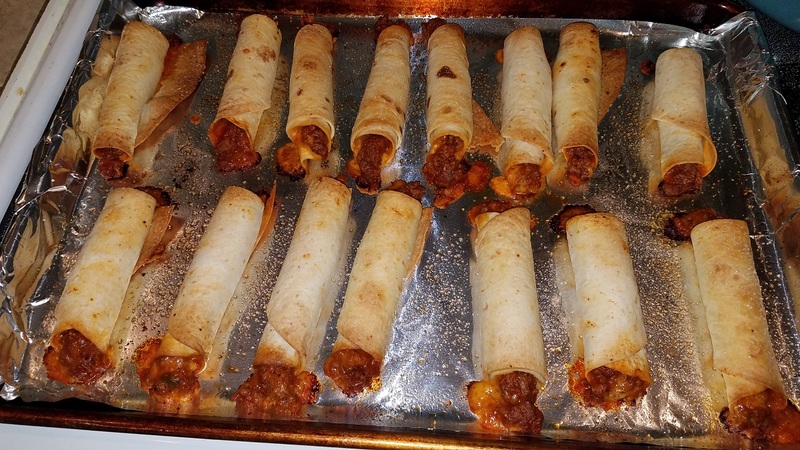 Slop-quitos? 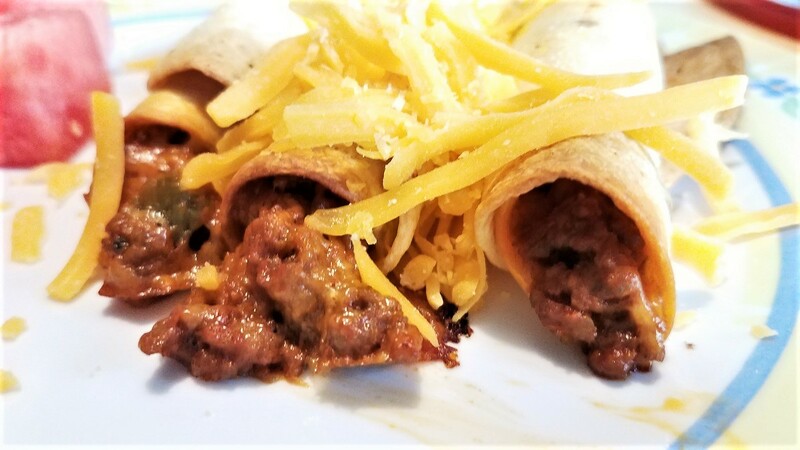 Sloppy-itos? Taquito-Joes? Hmmm. Once of those names should be clever enough to stick. 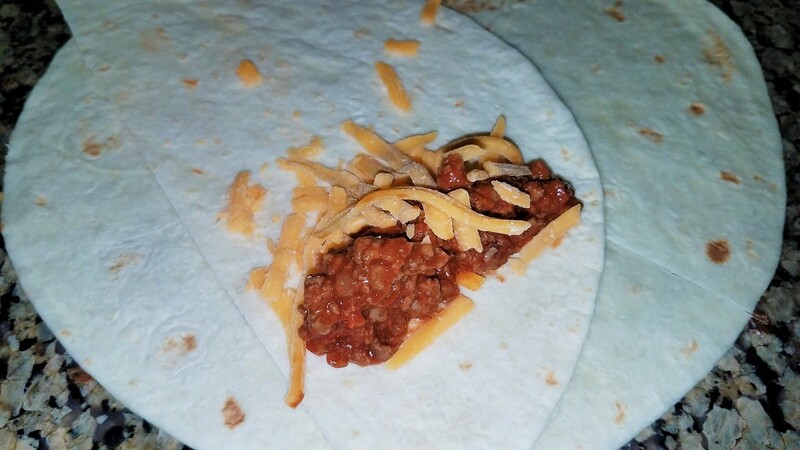 All you need to make these bad boys is some left over Sloppy Joe meat, some flour tortillas, a little shredded cheese, cooking spray, a cooking sheet and salt. 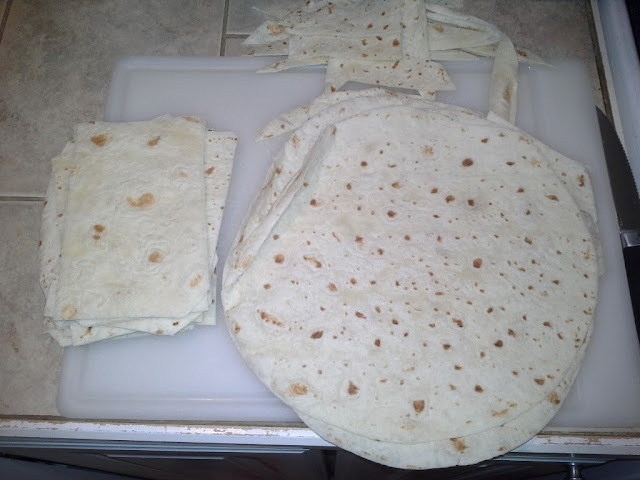 If you have small flour tortillas, just cut them in half, if you have the huge burrito sized tortillas, cut the edges off the tortillas and then in half to make a pile of rectangles. Place a little bit of Sloppy Joe meat in a line at one end. 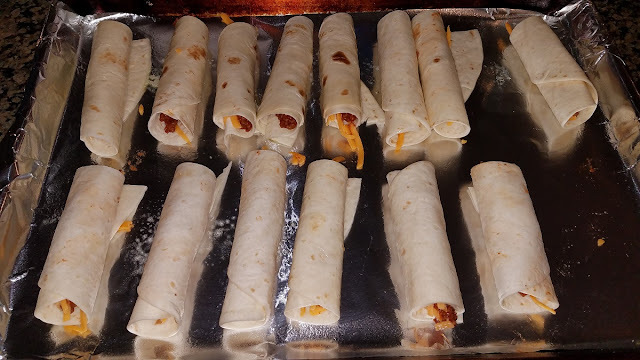 Add a tiny bit of shredded cheese and roll up the taquito while pushing down (to squish the meat to the ends of the roll) as you go ( I had the smaller tortillas this time so I just cut them in half). Good pressure while rolling will force the meat out to the ends of the tube. Place seem side down on the cookie sheet covered in foil until you have a full pan of Taquito-Joes. Lightly spray with cooking spray over the top of the taquitos (or melted butter if you prefer) and then crank some sea salt over the tops of the Slop-quitos. I might have to take a vote at the end, which name do you love best? These crunch up so nicely when you bake at 425º! No frying needed. Don't be freaked if some of the Sloppy Joe filling oozes out the end. It tends to bake to the pan and make these lovely ooey-gooey ends. After that, pop a few on the plate and sit back and wait for the "Ooos and Ahhs". Taquito-Joes - You are welcome taste buds! Okay, not so much of the Ooos and aahhs... you'll probably get a few side eyes and a "hey mom what IS this" look from your youngest, but when you explain it's their beloved Sloppy Joes in their favorite Mexican form (two worlds uniting as one)... you might even get a THANK YOU! You can pick them up and eat them with your fingers (always a plus with the youngins), although at least one of mine topped it with some extra cheese - and I have to ask myself, well why not!? 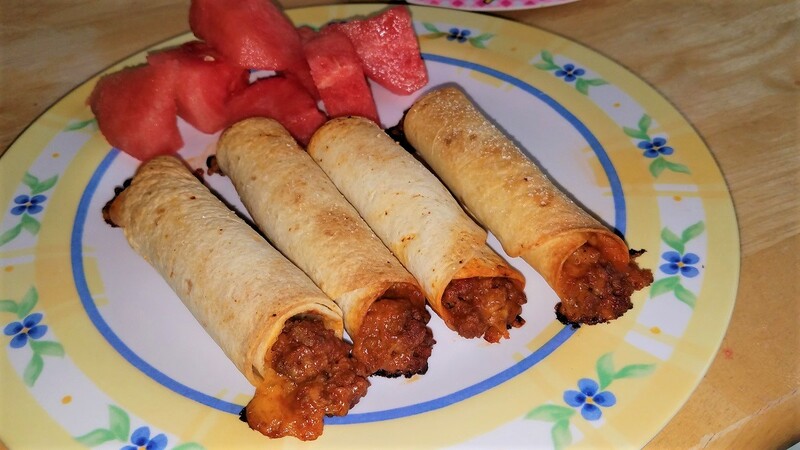 Sloppy Joe Taquitos - hey the original at least rhymes. All and all these were a big hit! If you are interested in our regular chicken taquitos, click here, which are also well loved around here. So let me know what you think I should call these crazy things, other than that it's going on my very short list of "things my kids will eat and not complain about"! Yay for me. Enjoy.